Our work on the six-phased redevelopment plan for Reading Station, one of Network Rail’s biggest current schemes involved two major civils contracts. Completed in 2016, the was a hugely ambitious scheme, intended to decongest the busy railway hub, making way for more trains and ensuring a more efficient service to commuters. Of the two packages of work released, Ramboll won contracts on both. Phase 1 included the design of two new bridges and the design of an earth retaining structure. The two new bridges are sited at Cow Lane, a notorious traffic bottleneck. The existing Cow Lane South bridge was replaced with a new reinforced concrete portal frame structure. Due to the time constraints imposed at this site, the new structure was precast in the time leading up to a 101 hour blockade booked for Christmas 2011. During the blockade, the existing bridge was demolished and the new bridge was transported to its permanent location using self propelled modular transporters. Phase 2 includes the design of two major railway under-bridges, significant lengths of retaining wall structures and strengthening work to a further bridge. The two main bridges are located either side of Reading Station: Caversham Road to the west and Vastern Road to the east. For Caversham Road our team designed a super-slender orthotropic steel deck capable of carrying the loads of the Great Western Main Line. 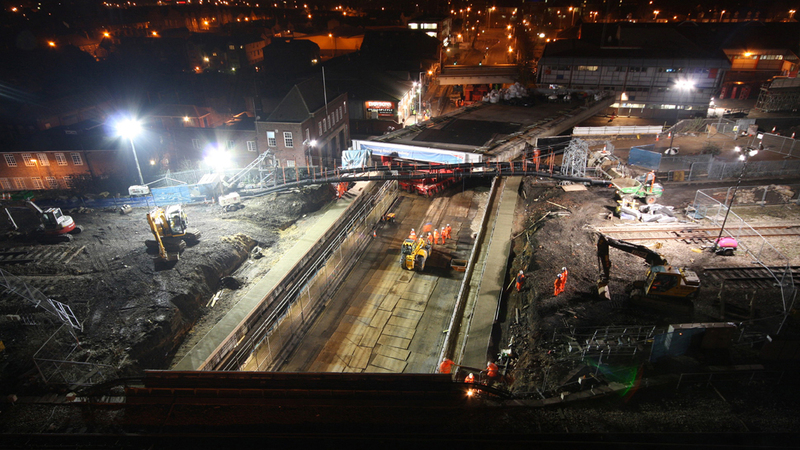 Our rail specialists designed a major rail bridge in Berkshire for BAM Nuttall and Network Rail as part of the six-year phased redevelopment of Reading Station and the surrounding rail network.